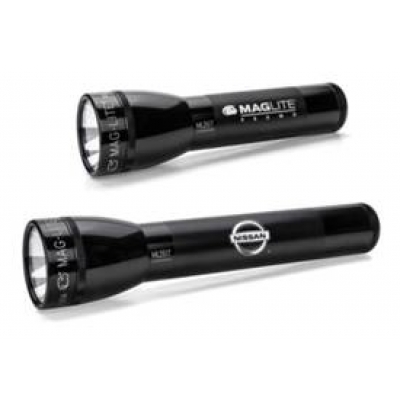 MagLite® ML25IT C-Cell Incandescent Flashlight with your Corporate Logo! New for 2016. Maglite's C-Cell Incandescent flashlight. We laser engrave your logo on the handle or on the head. MagLite® C-Cell Incandescent Flashlight with candle mode. 6.6" or 8.6" length. Requires 2 or 3 "C" batteries. Very bright, with a compact design. Easy to operate. Just twist the head to turn it on and off, and to focus the beam of light. Fine machined aluminum casing. Brightness: 30 lumens (2C cells) and 63 lumens (3C cells). • Packaged in a four color chipboard box. • Batteries are available for an additional charge. Method of Imprinting: Laser engraved. Appears white. Price includes your logo engraved in one location. Imprint area of 2-Cell: Head 5/8' x 1". Barrel 1/2" x 2". Imprint area of 3-Cell: Head 5/8' x 1". Barrel 1/2" x 3 1/2". Packaging: Full-color chipboard display box. Production time: 5 days. Rush shipping available upon request. Optional 2nd Location Engraving $1.50 (g) plus set-up charge. Optional Battery Charge: $1.90 (G) per battery bulk or $2.20 per battery inserted in the Mag-Lite.